Anything French and artisan, I'm in! I love scented candles, especially if it is artisan candles, and especially if it is made by French perfumer.... And it's been my lifelong dream to own a Diptyque candle. Ok... Maybe not lifelong, but it was a love at first sight since I saw the exquisite candle jar on Cupcakes and Cashmere blog years ago. Finally, now Diptyque is available in Malaysia. It took months for me to decide whether I should get it. When I finally decided on getting the Rosa Mundi scent, the sales assistant told me that it was last year's Valentine's Day limited edition scent. I'm so yesterday!!! When I was feeling all down that I've missed the Rosa Mundi candle, the SA at Diptyque told me that they have another limited edition scent for this year's Valentine's Day! My mood was lifted immediately. So I waited and waited and waited.... and the V-Day limited edition candle finally arrived our shore!!!! This year's Diptyque's Valentine's Day limited edition scent is even more interesting than last year's. They're marrying two of the best seller scent; Roses and Baies; and created the Rose Duet. From the delicate rose garden to the elegance of the English garden, Rose Duet takes you on a journey through a delightful garden. Why is Diptyque candle so popular, you may ask. The candles are made of special blend fragrances and high quality wax. That is why, after many years in the market, it is now a highly respected brand when it comes to artisan candles. There are two different miniature candle sets that are still available from the previous season. I kinda regret not getting the white set which has Figuier, Baies, and Rose. Another set, which is the black set has Opopanax, Feu de Bois, and something which I can't figure out how to read. That's the fun of Diptyque. They jumble all the words on the label and it is our puzzle to rearrange back the words. I hope the white set is still available when I get back to KL because I really want it and regret didn't get it the other day. When I was at the kiosk, the SA was really friendly to have a short chat with me (Look for Foong at Pavilion. He's so helpful and friendly). Foong told me that Diptyque started to produce coloured candles in the beginning. These are the original packaging. The super huge Diptyque candle that's on the display is so tempting. But it cost RM1000+. The price is really steep for a candle. But I think my dream to own it is not too far fetched. All I need is determination to save some money. This Rose Duet candle already has its own sitting on my perfume shelf. I'm treating it like one of my perfume because it smells so good! Imagine the romantic ambiance it will give me during Valentine's Day. This year, my Valentine's Day will be a bit different with all the romance in the air. Remember to check out the Rose Duet candle at Diptyque before it is sold out. Don't wait too long, or you'll regret like me (ahemmm.... 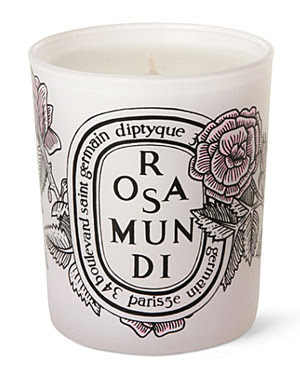 I still think of the Rosa Mundi candle from time to time). Diptyque is available at Pavilion, Bangsar Village 2 and Ken's Apothecary in Empire Gallery Subang. @Edazz Lucinda: The price is RM278 (if I'm not mistaken). Somewhere around that price.